The 'Game of Thrones' final season is almost here, barely ten days away as the cast members get together for its New York premiere. At the event, they recalled memories of their years working on the international hit television series. 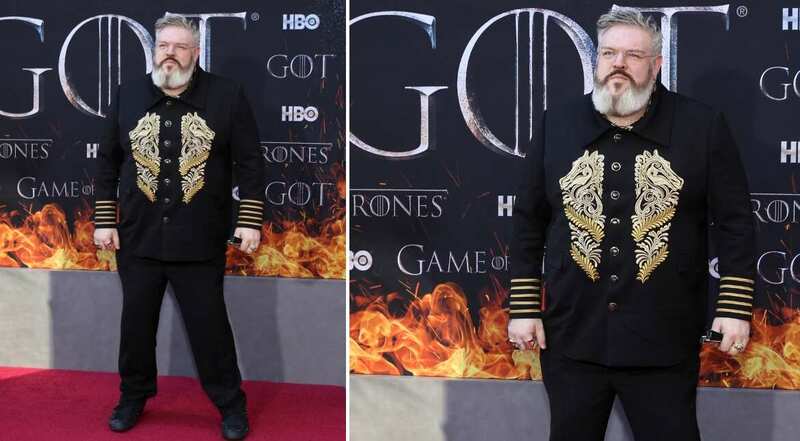 Dozens of actors, many of whom were unknown before the fantasy series began in 2011, flew to New York for the "last mile, the last carpet, the last premiere, this is the end", in the words of Kristofer Hivju, who plays Tormund Giantsbane in the series. Maisie Williams plays the role of the younger of the Stark sisters, Arya in 'Game of Thrones'. Here seen at the red carpet premiere of the series in New York, Maisie previously confirmed that the final season has a "lot of deaths". She also said that there will be a linking of many storylines from the previous seasons in the final season of the show. In a promo that leaked earlier from the upcoming season shows a preview of Jon Snow meeting with Arya after all these seasons of not being together. Jon a step-brother to Starks. The reel and real-life couple struck a pose at the red carpet premiere as they posed in red and black. While Rose's character died pretty early in the series, Kit's character Jon is a contender for the Iron Throne. Jon is quite a fan favourite with many rooting for his character to get the Throne and win the fight against White Walkers. In the last season, Jon acquired the support of most people to fight against the Walkers. In the upcoming season trailer, he was shown walking towards a dragon along with Daenerys (many hinting that he too would fly on one). The older of the Stark sisters, Sansa played by actress Sophie Turner came to the premiere with real-life fiance Joe Jonas. In the series, Sansa has an interesting plot-line, tormented and violated in almost all seasons to now becoming a force to reckon with. She is the Lady of Winterfell, the rightful heir to her father's lineage as she is currently the oldest Stark alive. In the new trailer for the upcoming season released, she is seen greeting the Dragon Queen as she welcomed her to Winterfell. In a recent interview, Sophie revealed that the season finale will have more than deaths than all episodes before. The Dragon Queen as most 'Game of Thrones' lovers would address her, Emilia Clarke looked like a vision in pale blue gown with lots of tulle. Emilia plays the unmissable Queen on the show who wants to get the Iron Throne from the Lannisters by any means. She has an Army, love and support of Jon Snow, Tyrion Lannister as her Hand, three dragons (actually two now) and the blood of the rightful King (as she thinks and most viewers would agree). In a recent interview, she revealed how "heartbreaking"' it was for her to shoot the last season as she would miss the family she has made on the sets, shooting for the series. She wrote a heartwarming post after the wrap up of her 'Game of Thrones' shoot. She wrote: "Hopped on a boat to an island to say goodbye to the land that has been my home away from home for almost a decade. It`s been a trip @gameofthrones thank you for the life I never dreamed I`d be able to live and the family I`ll never stop missing." Gwendoline Christie does not look anything like her character Brienne of Tarth in the series -- with that short boyish hair, stuck-up attitude, non-feminine outlook and more. In real-life, she is ultra-glamorous. Brienne has a nice buildup in the series, from shifting loyalty (Baratheon to Stark) to guarding Sansa Stark as promised to her mother, falling in love with Jaime Lannister and being an uncompromised sword fighter. Looks like Brienne will have a large role in the upcoming fight against the Walkers. Nathalie turned up at the premiere in a beautiful orange-coloured dress, sporting her natural curls. She plays the role of Dragon Queen's most trusted adviser, Missandei who the former had saved from the cruel Masters of Astapor. She was initially a slave who was freed by Daenerys, at the time when she took the Unsullied Army with her. Missandei, has since then, played an important role in every decision that Daenerys has taken. She is one of the few supporting characters that is not vying for the Iron Throne and has survived in all these seasons. The sultry-red priestess Melisandre played by Carice is undoubtedly one of the most mysterious characters on the hit series. A believer of the Lord of Light, Melisandre has in many ways led to the fate of the central characters as they are now. She killed off the youngest Baratheon as she supported Stannis, she then left him when he was close to being defeated to ride for Winterfell. At Winterfell, she reached at the time when the Brothers of the Night Watch planned the murder of Jon Snow. This was all just in time as she brought him back to life with her magic. She is now with Daenerys as she feels that Jon and the Dragon Queen have a bigger role in the literal Game of Thrones. Remember when she took off that necklace she wears all the time and showed the viewers her real self. We hope the makers reveal her story line in the last season, as to how she became a witch and started following the Lord of Light. Undeniably the most adorable character on the show, Hodor played by Kristian was killed off in the previous season as he protected Bran Stark from the dead. From 'Hold the door' to 'Hodor', Kristian's back story was one that made all of us sad. Peter Dinklage posed happily at the red carpet as he was spotted with actress Erica Schmidt. He plays the iconic role of Tyrion Lannister, who even after being a Lannister has not seen a favoured history in the last seasons of the epic show. Playing a classic underdog, Tyrion has seen it all from being tried for murder of his nephew to being caught by Jorah The Mormont, to joining the camp of Daenerys as her Hand and now also the first to have seen Jon and Daenerys getting together on the ship to Westeros. He plays a well-read man who loves his wine and girls. Peter brings a lot of depth to his character on the show with his impeccable acting.